Who watched Golden Globes on Sunday? I certainly did! Of course Zoey Deschanel did not disappoint with a super cute awards night manicure. She did tuxedo nails at last year's Golden Globes that became all the rage, as well as Retro TV nails at the Emmy's. 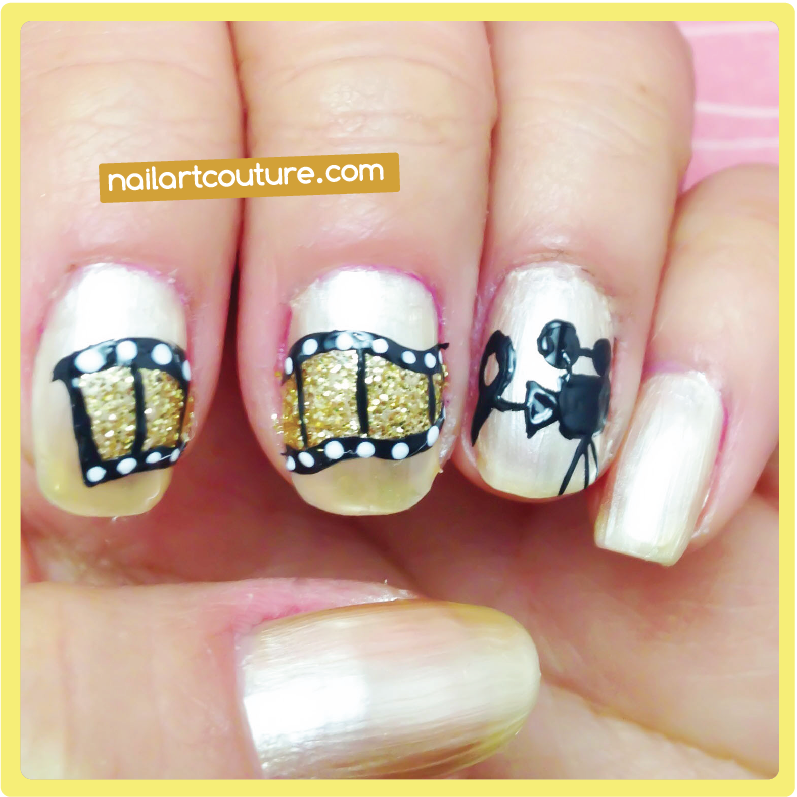 This year she brought us film strip manicure! Her nail art is pretty on trend, since it is a type of "puzzle nail" that is increasingly popular. 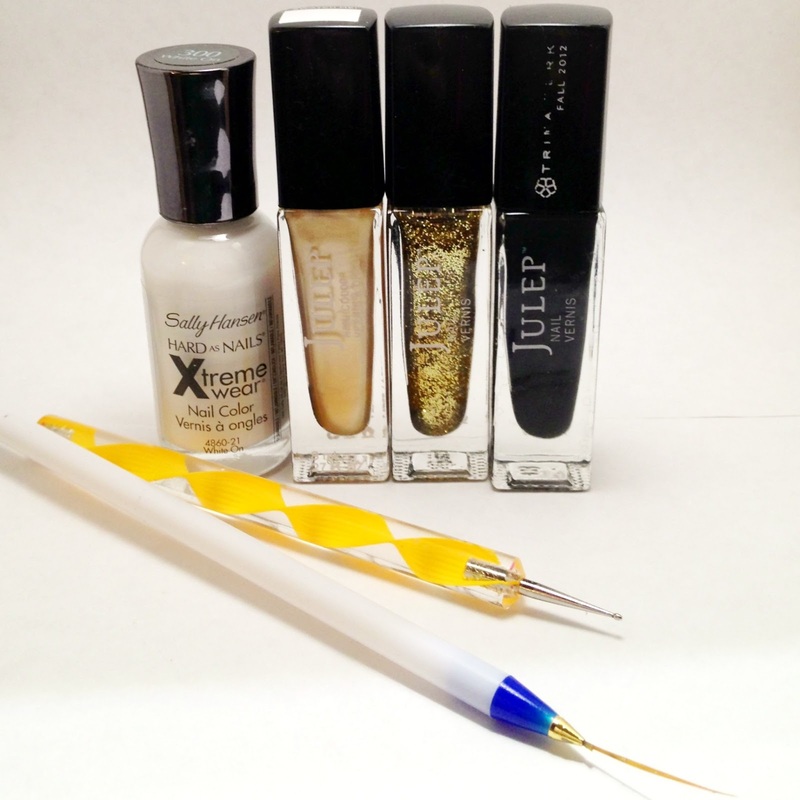 Unlike a lot of puzzle nail art out there, it is extremely easy to do. But it is also extremely easy and fun to do! This is the picture Zoey instagramed to her fans. She wore this nail art with her gorgeous red Oscar de la Renta dress! Want this cute manicure on your nails, check out the easy to follow tutorial after the jump! Paint your nail a champagne or white polish and allow it to dry. Using a black polish, create the film camera on your ring finger. Create a small rectangle off to the side and draw a triangle pointed towards the rectangle. Create 3 lines for tripods, two angles line and one straight line. Next, using a large end dotter, create two lines circles above the rectangle and draw a line to attach to connect everything. Create a swirl in the in the empty area of the ring finger. The thinner area should be coming out of the film camera. Next create the outline for the film. If you want more movement in the film, create deeper curves. Using a gold gitter polish, fill in the outlined area. Using black polish and a thin nail art brush, thicken the border of the film and add in spaced out lines. Paint your pink and thumb in the same champagne color and do any touch ups that is necessary. If you were wonder how Zoey did her Golden Globe nails, I really hope this tutorial helps you out! 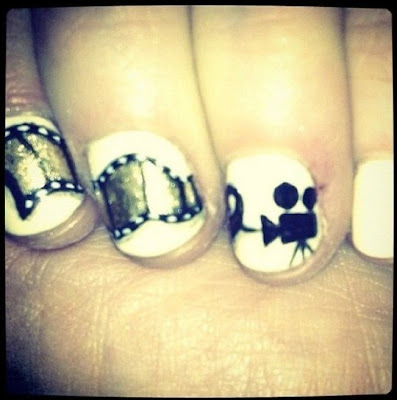 Below is the picture Zoey Deschanel shared of her nail art on her instagram. Love it! Love the color combos and the design. You def have the talent so keep it up. Great job! Hey, I was just thinking of having a go at these, you did a great job! The gold mixing looked great and like your idea.